Earlier this week, I spoke at the Heathfield High School assembly, talking about the upcoming Youth Alpha we are going to run in the school. Last Friday, I spoke during chapel at Bishops Diocesan School, encouraging the boys to be open to God’s call on their lives as they make plans that will shape their future. They are two schools from very different worlds—one is in a coloured area, attracting co-ed learners from a primarily low-income background and attracting many African immigrants. The other school is probably the most elite boys’ school in the country; it would be similar to America’s Woodberry Forest School. 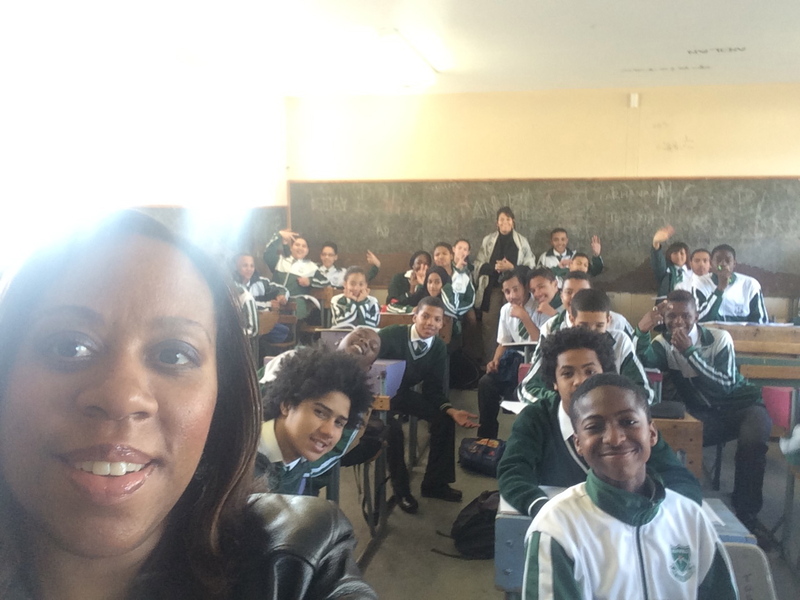 I love working with young people in South Africa. I have to admit that I often have an instant “in” with them as soon as I open my mouth. They are so fascinated about America and American culture and often ask me the most interesting and sometimes uncomfortable questions. Although I have been living in Cape Town for more than two and half years, I am still somewhat dumbfounded over the prevalence of American culture in this country. If you turn on a pop radio station, 90% would be American singers. Reality shows, police dramas, Dr. Oz and the like, and sitcoms from the States dominate TV channels. What’s showing at the cinema? mainly American movies. But what is really sad is that a lot of the entertainment we export here doesn’t paint us Americans in a good light. Young people often ask me, Is everybody wealthy in America? Do you have any homeless people? Is it really that violent there? Many are shocked to find out that we have homelessness, people addicted to the same drugs that are destroying lives here, and other issues. Many African youth are fascinated with African Americans and our culture. Have you met Jay Z?, a young man recently asked me. Do rappers really dress like that? I love how African Americans speak. I love your gospel music. I often smile. I can relate to some of those cultural questions; others, I cannot. It gets complex. I think what grieves me the most are shows, such as My Sweet Sixteen and Pimp My Ride. Many youth think it’s not uncommon for Americans to spend $10,000 on a young person’s 16th birthday, and this insane excess is influencing them to pressure their parents to pay a lot of money (sometimes going into debt) for matric balls (similar to the American prom) and 21st birthday parties. I try to explain to young people that these reality shows aren’t real; that’s why these extremes are on TV. Ordinary Americans don’t live like that. As we live as community, we begin to break down perceptions such as these; and that is one of the beauties and challenges of cross-cultural living. As always, great to hear from you, Nicole. This media problem exists everywhere. We have problems with body image because only a certain type of beauty is portrayed in our media (and is portrayed relentlessly). We have kids not understanding their relative affluence in the world because, while they have so much, they don’t have what the super rich have that is portrayed on TV. We all need perspective. Much love to you and Wayne.